4.5 stars really. 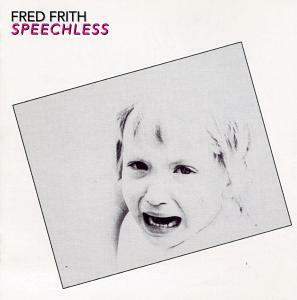 For his second solo album of the 1980s Fred Frith followed a similar format to Gravity, using different backing musicians for side a (Etron Fou) and b (Massacre). It's a very different album, however; the eccentric dance music of the previous album has given way to a darker, more obviously RIO style of composition and performance, with greater emphasis on studio work and use of taped sound sources. The tracks recorded with Etron Fou on the first half of the album are perhaps the most fully realised of the four collaborations that make up Gravity and Speechless, and at times we are offered a glimpse of what Henry Cow could have sounded like had they continued into the 1980s. Ferdinand Richard and Guigou Chenevier are a muscular and versatile rhythm section whose playing often calls to mind the John French/Rockette Morton partnership in the Magic band, while Margot Mathieu and Jo Thirion provide highly responsive foils to Frith's guitar and violin work. The highlight of these tracks is the labyrinthine Laughing Matter/Esperanza, which is full of unexpected twists and turns and includes a highly effective guest appearance by a bagpiper. The second half of the album features Massacre with some Frith solo pieces thrown in for good measure. The avant prog power trio are augmented with a horn section including the brilliant George Cartwright of Curlew, and these tracks also contain some superb lead guitar. Three of the tracks were based on concert recordings - on Saving Grace parts of Massacre's brilliant Legs surface briefly - but were given extensive post production treatment. The overall feel of the pieces is a little more abstract than other parts of Gravity and Speechless, and the arrangements have a more spacious, looser quality. The centrepiece is Balance, on which Frith plays all the instruments including some dub inflected bass (sounding rather like Bill Laswell) and which recalls some of Henry Cow's darker moments. The brief Conversations With White Arc could have been a Residents out take; Frith had collaborated with them at around this time and the album was originally released on the Resident's Ralph label. Speechless is more overtly experimental and consequently less accessible than Gravity, but it's also a more coherent album. It dates from an extremely productive phase in Frith's career, and is the most essential of his early 80s solo works. Highly recommended.